You may have noticed that things are changing in the world. It feels fast and furious, stressful and in many cases downright heartbreaking. Yet here we all are waking up, making breakfast, taking care of our kids, going to work, writing and reading blog posts, drinking coffee and living our lives. Some things feel the same, but one look up or out, and it’s clear that everything is changing. 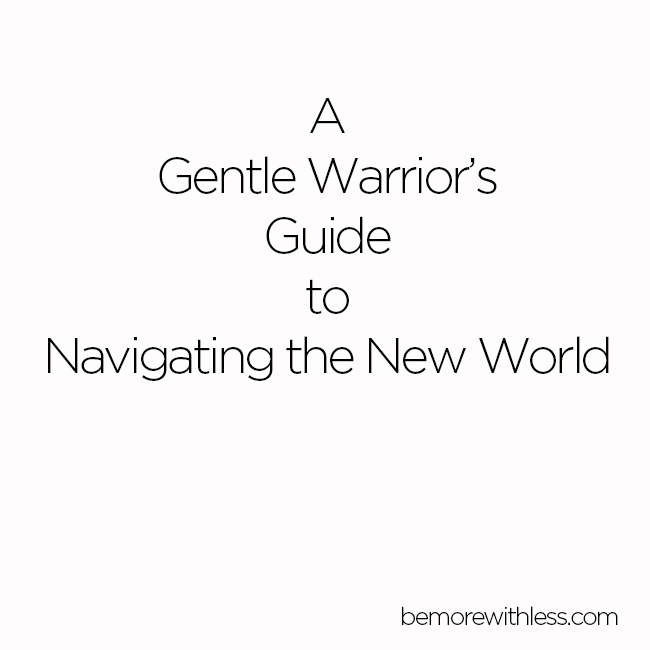 Regardless of the line you’ve chosen to walk in these trying times, please join me in becoming a gentle warrior. 1. I will take care of myself. This comes first. If I want to be a gentle warrior, I have to be healthy, calm, and well-rested. Routine is more important than ever. While it’s tempting to fuel my emotions with sugary treats or calm my nerves with a glass of wine, or 2 or 4, instead I’ll take care of myself and double down on healthy habits and prepare not for one battle, but for the long journey. If you feel rundown, or if stress is starting to affect you physically, pull back and assess. Are you putting yourself first? Are you building strength or avoiding pain? What’s one thing you can do today to take better care of yourself? You can only save the world if you save yourself first. 2. I will protect my mornings. Writing, meditating and exercise come before the news, Facebook, email or anything that may derail starting the day with love and intention. It may be irresponsible to completely check out but everything will be ok, better even if I take a few hours in the morning to tune out and tune in. Who runs your day? If you are a stressed out mess by 8:00 am because of your politically charged Facebook feed or because you ate your breakfast while watching the news, reclaim your morning. How you choose to start your day will impact how you move through the rest of the day. 3. I will be kind. I can stand up for what I believe in without being snarky on social media. I can make a difference without engaging in contentious conversations. I will live and act in alignment with my values and my heart even when I strongly disagree with someone. Check yourself. Are your conversations, and social shares inspiring action and thoughtful conversation or fear and hatred. If it’s somewhere in the middle, can you scoot towards being kind? 4. I will be brave. I will stand up for people who cannot stand for themselves. I will not tolerate humans not treating humans like humans. I will support my friends who are brave enough to speak up. When I feel too scared to do it alone, I’ll ask for help. What does bravery mean to you? Is there something you’ve wanted to do or say, but felt fearful about the response? Start with a small action like sending a thank you note to someone who was brave enough to do something you wanted to do. Like everything, bravery can start small. 5. I will take action that matters. Instead of wallowing, griping to friends, or giving up, I’ll take action. I’ll donate money to causes I support, give my time and energy to help move the needle, and help lift up the most compelling voices. Action alleviates fear and worry. Ask a friend to join you at a local meet-up. Volunteer for a cause you believe in. See what happens when instead of getting lost in the oh-nos and what ifs, you take action to support what matters to you. 6. I will keep listening. I don’t know it all, or even most of it. I won’t take a stand for the sake of being right or controversial. I’ll keep listening and stay open to new ideas. I’ll keep listening to my heart too. Consider new information. Don’t be afraid to change your mind. When you do stand up, ask yourself why. Is it because you believe in this or because you are afraid not to? Listen to your heart. 7. I will still laugh. A gentle warrior still needs to smile, laugh, and enjoy time with her friends and family. Call a friend who makes you laugh so hard you cry. Plan a date night with your love. Watch your favorite movie. Don’t leave joy behind as you navigate the new world. 8. I will keep things simple. Simplicity has transformed my health, my home, my life and my work. Things build up and get complicated, but I keep coming back to simplicity. It means saying no, cutting things out, streamlining and sometimes stepping back to really see what has to change. Keeping things simple isn’t always the easy choice, but practice anyway. Be strong for the things you can’t control, by simplifying the things you can. 9. I will remove the drama. Things are dramatic enough without adding another layer of my own, “the sky is falling” drama. I’ll stay up to date on the headlines with The Skimm instead of the drama of the nightly news or tweets from the white house. Pay attention to what’s real and what’s drama. Write down what you are thinking and feeling. Words on paper will help to edit out the drama going on inside of you. 10. I will go to the beach. I live in Utah so going to the beach is a really long drive, but I’ve been happy there so many times that I can simply close my eyes and feel the sand between my toes, taste the salt in the air, and hear the crashing waves. When things feel too tough to bear, I’ll go to the beach for a few minutes to rest and fill my heart. Take a time out and go to your happy place. If you need a little glimpse of the beach, here you go. Then come back refueled and ready to start again. I became a gentle warrior by identifying what mattered to me and doing what was necessary to protect it. My tactics are fierce, but also soft. Join me by adopting some of the guidelines above or create your own. Take care of yourself because we need you. While navigating the new world, we need to show up for each other. Thank you for another wonderful post, Courtney. I definitely needed this in my life right now. I’ve been rushing around trying to keep up and catch up with everything and everyone. But I really need to slow down and lead a more gentle life. I’ve let myself get frustrated and let things become complicated. I need to simplify my life, learn to let go and be a gentle warrior. I need to defend my health and happiness. Thank you again! Please do Nathan! We need you. This is very helpful. Thank you for the reminders and for speaking up. I feel we all gain strength to fight for what’s right from knowing that we stand together. We very much need to approach the coming period with clarity and compassion. Cheers to clarity and compassion. We could all use more of that. This is exactly what I needed to hear. I just deleted Facebook from my phone because I was feeling overwhelmed with all the negativity on my feed. I think I’ll take your advice and reclaim my mornings and not let Facebook be my source of news. Thank you for this perfectly timed article!! Thank you Kiwijo. I applaud you for stepping away. Nothing can be accomplished in that downright nastiness. Thank you Erin, I love that not only did your husband see the damaging effect the Facebook Politics was having on you, but you took his advice. The new world will be ok as long as we are there for each other. Courtney, I love this advice and I am sharing with my group. Many of us are struggling and trying to focus on the positive right now. I think often of Stephen Covey’s advice – focus on your circle of control and influence and let go of the rest! Great advice. Thanks for sharing Kathleen. This will be my only comment here concerning this, but though I completely understand the necessity of taking care of yourself, your ‘circle of control’ stretches far wider than just making sure your favorite tea is there in the morning. It scares me to think that compassionate people will retreat to their own home sweet homes and let the others run the world… not to spoil this wonderful with politics, just keep in mind that if you do not influence the world around you, others will do it for you. Hey Courtney, thanks for your kind reply. My comment wasn’t directed at your original post, but more on Kathleen’s comment – anyhow, I agree that there must be both, retreat and take action. Thank you for this post which I really needed right now! I am so sad and disturbed about what is happening in the U.S.A that I needed your tips to remind me to take care of myself first. I started getting into the habit of starting my mornings checking the latest news and I need to get back to my normal practice of meditating before starting my day. Thanks for the wonderful tips. I always feel uplifted when reading your posts, thank you. Three things stood out for me – “Be Kind”, “Still Laugh” and “Remove Drama”. Even here, far away in Australia, our airways and social media is dominated by the disturbing news coming from the US, on a daily basis. And many aspects do affect us, directly or indirectly. It’s hard to keep positive, so thanks for mentioning “Skimm”. Kindness is sadly rare in today’s on-line communications, so it’s important to remember that we can still explain our views, but do it kindly. Laughter releases tension – I still laugh out loud at “Frasier” repeats, so try to watch one episode each evening, before bed, to re-set my equilibrium. It all helps. Cheers, Lisa in Melbourne. This post is super helpful Courtney because the news and what is going on in our country is completely stressing me out 🙁 Thanks for the reminder that we need to take care of ourselves! Ahh gentleness… It takes presence to inject it in our daily lives. It is too easy to ride the busyness of our minds and start doing things that will harm ourselves or others out of our unconsciousness. Thanks for the affirmations. I think that they are perfect for everyday meditation. As I deal with a difficult co worker this week I will be a gentle warrior. Courtney, thank you so much for this wonderful post! Like so many others, I’ve been appalled by the sheer nastiness online lately. Whatever our beliefs or politics, there’s just no excuse for all the name calling and insults. I love your idea of us all being Gentle Warriors. I’m going to reread this post frequently and share it wherever I can. Part of my “decluttering” this week will be to remove myself from toxic sites and discussions and take better care of myself. Thank you for this uplifting inspiring reminder to be our best selves! Such timely and great advice Courtney. I’ve been trying to figure out how to find the balance between staying informed and engaged, but not getting sucked up into the hot mess too far. It’s not that I don’t want to take action. I do, but I want to approach it from a calm place. I’ve been at least trying to practice a lot of self-care. What good is putting up the good fight if you are sick and depleted! This was medicine for my soul this morning, thank you! This is so perfect for me right now. I’ve been trying to figure out how on earth I can be informed and effective without losing my mind and here you gave me some PRACTICAL answers. Thank you. Now for some digital decluttering. Thank you for the reminder that we are in control, but that we have to take action to change how we navigate the new world. I’ve been feeling overwhelmed by, yet drawn into the political conversation lately. Time to set some boundaries and add in some self care time. Change requires effort. This.Is.The.Most.Perfect.Post. Thanks, much. I have been worried and complaining and not taking action. This all stops, NOW! Thanks. Thanks. Thanks. Again, this post is perfect and so needed. I have been following your blog for a while, actually since 1 Jan 2017 to be precise, when I suddenly got overwhelmed with work and was not sure how to navigate my life in 2017. You mentioned we should reclaim our mornings. I have been struggling with that for the past couple of years. You see, I am a teacher. My mornings are crazy. I wake up at 5.50 am to be in time for school which starts at 7.30 am. Would you have any suggestions on how I can have a less hectic morning? I would appreciate it if you could share with me how I can carve out some quiet/peaceful time in the morning. I know it can be a challenge when your mornings start early, but consider waking up 15 minutes earlier and make those 15 minutes just for you to enjoy a cup of tea or coffee, to stretch, meditate, read, whatever you want to do. It doesn’t sound like a lot of time, but it makes a difference.